Iliotibial Band Syndrome is a common injury among runners and tri-athletes. Eventually running's pounding nature overwhelms the tendon on the side of the knee. Most people begin feeling tightness and soreness on the outside of the leg that becomes more painful. As the injury worsens, the pain increases and eventually stops a runner in his or her tracks. The Iliotibial band is a tough group of fibers that runs on the outside of the quadriceps and eventually inserts on the lateral tibia (outside of the knee). The IT band is unique. It is a large sheath of tissue, called an aponeurosis. 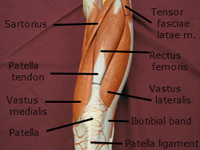 The gluteal and tensor fascia lata muscles attach to the top part of it. These muscles help stabilize the hip during running, and help keep your "hip and knee from wobbling side to side." Hip and knee stabilization is very important to running efficiency and speed. The wide aponeurosis becomes a narrower rope-like tendon near the knee and as it crosses the side of the femoral epicondyle. As the iliotibial band attaches to the tibia, its rope-like structure spreads out to a wide attachment site. More on knee anatomy. The hip and knee stabilizer muscles are often the first to fatigue while running, which creates an increasing "wobble" during the run. The bottom part of the IT band tendon absorbs much of this force, which is why the pain is usually near the insertion point at the knee. 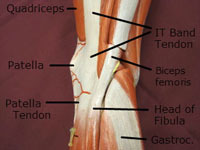 This tendon also experiences the most amount of tension when it is slightly bent, like during a tired running gate. 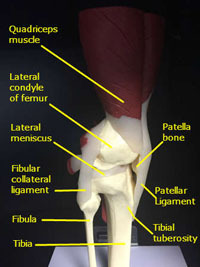 Fatigued hip and knee stabilizer muscles cause small micro tears in the tendon, and chronic repetitive use causes an accumulation of these tears. Eventually the micro tears lead to larger tissue tears and sprains. Runners and triathletes often experience iliotibial band friction syndrome with increased training mileage or volume, especially as they near peak training volume. Most commonly it occurs as athletes are ramping up for a bigger event than they have ever performed, such as moving from a 5K to a 10K or from a half marathon to a full marathon. We have had many people in the office who suffer from IT band syndrome every time they reach a certain distance on long runs and they are very concerned it will prevent them from reaching their goal of a marathon. Overuse injuries usually occur near peak training, which means there is little time to rest before the goal race. The IT band plays an important role in knee stabilization; injuries and flare ups often occur when people change their running surfaces and increase the strain on the stabilizers. A nice soft and smooth trail is easier to run on and does not challenge the stabilizers like a rocky trail. Running 10 miles on a canal or lake trail is not as demanding on the ankle, knee, and hip stabilizer muscles as six miles on a rocky up-and-down mountain trail. The variations of terrain, rocks, tree roots, inclines, and declines wear out and fatigue the muscles faster, which increases the likelihood of micro tears, sprains, and strains. Likewise, running on an road with a slight curve near the curb keeps the ankle slightly inverted and increases the forces on the lateral knee and IT band. Runners who always run on one side of a road often experience pain on the outside of the knee. Iliotibial band friction syndrome is a condition that keeps people from running or finishing their race. A mild or moderate injury feels stiff and sore at the beginning of the run, but eventually disappears. A few miles later knee stiffness and soreness begins and increases throughout the race with increased tendon damage and inflammation. A dull ache becomes a sharp and stabbing pain. Eventually the body will stop you from continuing to damage the tendon by making the pain unbearable to walk on, let alone run. It becomes very tender to touch the outside of the knee, and every runner can cause sharp pain by rubbing or putting more pressure on the IT band tendon insertion or outside of the knee. Why do Some Runners Develop IT Band Syndrome? Everyone's running gait is different. Some runners are much smoother and more efficient than others. Think of Olympic or professional runners; they are not pounding the pavement at the end of their race, they are still gliding across the ground. When they run, they are propelling themselves forward and their body weight is not pounding down into the ground. Very little impact force is absorbed by their ankle, knee, and hip muscles and joints. We are also seeing them at their peak condition. They have run that distance many times and are not excessively fatigued or exhausted. Their hip and knee muscle stabilizers could keep going for many more miles. Most of us do not run like that and are not in top notch condition We are not as smooth or efficient. Even in the beginning of the race, we strike the ground harder and send more pounding forces up to the ankle and knees. The only thing we do better than the professionals is fatigue and challenge our stabilizer muscles. Unfortunately, our knee and hip stabilizers are not as strong or trained as elite runners. A runner who who is efficient and well-trained has strong stabilizers, is running a consistent number of miles per week, and is not very likely to develop a stabilizer injury. On the other end of a spectrum, an inefficient, out-of-shape runner following a six-week first marathon training program is destined for a stabilization injury. Tendons and ligaments are built to absorb force. The body adds extra structural fibers to strengthen an area when the tissue is under stress. A stressing stimulus such as a five mile run causes the body to build up enough fibers to handle a six mile run for that same speed, gait, and terrain. The body's build up fibers does not occur overnight and takes days to weeks. Think of training for a marathon. A well-designed training program slowly builds up the miles while controlling the speed and terrain. Ideally, we would train on similar surfaces and hills that will be in the race. Training provides a reasonable stress stimulus into the body that triggers tissue repair and remodeling in muscles, tendons, and ligaments. If the stimulus force was excessive, it would tear up and damage the fibers more than they could repair, which in running will lead to chronic repetitive stress injuries. A well-designed training plan challenges the body but does not overwhelm. From a provider standpoint, the training program has to train all of the muscles appropriately to handle the forces placed upon them in training and race day. It does not matter if the quadriceps and hamstring muscles can handle a 12-mile run if the knee stabilizers can only handle a six mile run. Miles six to eight will cause micro tearing that the body can repair in the next week. However miles 8-12 are tearing up the knee stabilizers and causing excessive damage. In addition, compensating muscles and tendons will try to absorb some of the excessive forces, leading to additional soft tissue damage in the leg muscles and joints. In this scenario, the quadriceps and hamstrings felt an appropriate stimulus with the right amount of force. However, several other muscles and tendons are overwhelmed and have structural tears that will require time to heal. A few more weeks like this will lead to some type of painful chronic repetitive stress injury, such as IT band syndrome, patellofemoral syndrome, patellar tendinitis, Achilles tendinitis, posterior tibialis strains, shin splints, or plantar fasciitis. Smaller muscles and tendons will break before larger muscles and joints. We are all familiar with the saying, the weakest link in the chain breaks. This is a very true statement for the body’s muscles, ligaments, tendons, and joints. Running injuries are most commonly the result of over-stressing an area and it breaking, and usually the area is injured because it is compensating for a weak area somewhere else in the body. Injury prevention and sports medicine starts with analyzing and evaluating the weakest links. Very commonly in iliotibial band friction syndrome patient's symptoms started with a dull pain in the thigh or quadriceps that shifted toward the knee joint. Runners who actually stretch (the few and the proud) will remember feeling tightness in their hips, glutes, hip adductors, quadriceps, hamstrings, and calf muscles. Usually there is not any particularly sore muscles, just increasing tightness in multiple muscle groups. Some noticed a tight or sore low back in the mornings after a long run. Both legs were achy and getting stiffer. It started taking longer to loosen up on runs. The knee and ankles would feel more stiff in the morning. Knee flexion and extension felt stiff and heavy. Ankle flexion and extension would cause stretching in the lower leg muscles. Of course these diligent stretchers would rationalize they should be getting sore with running or long runs. Those are all subtle signs of overtraining or early repetitive stress syndromes. There usually isn't a single source of pain, just more of a feeling that the system is off or tired. People who have had specific knee tendinitis injuries might start using their foam rollers and working the quadriceps and hamstring muscles. The prostrech comes out of the closet to help loosen up the gastrocnemius and soleus. Some people consider using an ice pack, but going for one massage seems like a "better plan." None of those strategies are working toward improving the integrity of the weakest link in the running gait. Sports medicine and physical medicine will help decrease the pain and inflammation around the damaged tissue, but its greatest benefit will be to identify the weak points in the running gait. If weak hip abductors or gluteus medius is leading to the hip and knee to wobble, then strengthening those muscles will reduce the strain on the IT band. Going back to our analogy, the hip musculature was showing signs of fatigue at six miles, which caused excessive strain to the IT band. At 10 miles, the muscles were exhausted and causing significant damage to other structural soft tissues. Specific exercises can strengthen those hip muscles to handle 15 miles, resulting in proper hip stabilization during hip flexion and extension. The hip never begins to "wobble" and place excessive stress on the IT band. 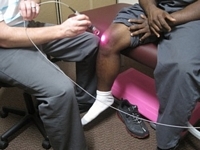 After your physician or therapist diagnoses your specific knee tendinitis injuries, treatment for those specific weaknesses and injuries is difficult and time consuming. Therapeutic exercises and stretches can be tedious but are necessary for long term results. Many active and fitness-oriented adults have a problem properly resting and working through the injury treatment process. They want health now. Your physician or chiropractor may order x-rays or an MRI to evaluate the knee bone, muscles, tendons, and ligaments. Many times the advanced imaging is not needed when orthopedic testing and exam evaluation findings indicate IT band tendonitis. 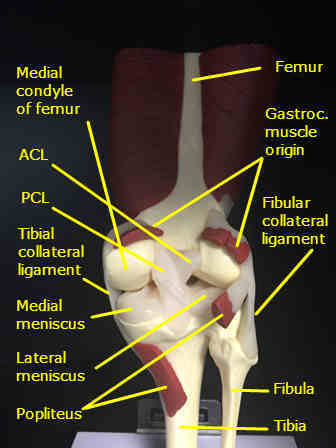 Differential diagnoses may include patellofemoral pain syndrome, patellar tendinitis, knee meniscus tears, quadriceps tendinitis, bursitis, stress fractures, hip labral tears, and low back injuries. Functional strength testing can be used to further determine muscle strength and endurance weaknesses that contribute to these conditions. IT band braces and bands are often recommended to reduce the stress on the knee tendons and speed healing. Hip, gluteal, and adductor stretching is just as important as strengthening exercises. Foam rolling can be beneficial to decrease muscle spasms and trigger points in the quadriceps, hamstrings, calf, and gluteal muscles. Foam rolling and over the counter NSAIDs are not substitutes for stretching and strengthening the affected muscles. One problem with foam rollers is that people believe they are a substitute for stretching or massage therapy. Foam rollers help increase blood flow and relax overworked muscles, but they do not break up scar tissue or fascial adhesions. Many people apply too much pressure and aggravate muscle injuries. Changes in running shoes should be considered, especially if the wear patterns on the shoes are abnormal. Not all running shoes are created equal; some shoes are designed to reduce overpronation of the foot. A runner who has excessive overpronation may benefit from a shoe specifically designed to limit this excessive pronation. Specialty running stores will watch you stand and run, and will expertly recommend a shoe that works best for your level of pronation. A knee injury does not mean that you are in the wrong shoes, but it is worth the evaluation to see if you can find a better shoe for your running gait. Commonly runners do not replace their shoes often enough and the worn out shoes do not absorb pounding forces. Your physician or sports medicine doctor may recommend over the counter or prescription anti-inflammatory medications. Some athletes respond to analgesic creams to relieve pain and inflammation. Cortisone injections may be utilized in some cases for pain and inflammation, especially when trying to aggressively treat the injury. Depending on your other symptoms, a referral might be considered for a foot and ankle specialist or orthopedic surgeon. Surgery is rarely performed for knee tendonitis injuries, but some patients develop chronic knee tendinitis as the body attempts to compensate for joint meniscus tears. Physical therapists and doctors may recommend orthotics for extra arch support; however, it may take several weeks to months to adjust to orthotics and it is sometimes better not to add them while training for an event. Some people feel immediately better with the shoe inserts, while it is too dramatic of a change for others. Discuss the options and best strategies with your healthcare provider. 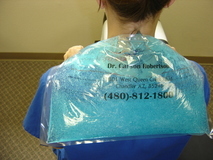 Heat, ice, electric, cold laser, and ultrasound are common therapeutic modalities used to speed healing. Acupuncture and dry needling are additional treatment options for decreasing muscle spasms and trigger points throughout the glutes, hip, and thigh. Muscle spasm and tightness reduces range of motion and strength, which contributes to many chronic repetitive stress injuries. Combining traditional physical therapy techniques with a quality massage therapist enhances treatment and recovery from running injuries that involve multiple muscle groups and joints. Overuse injuries commonly produce muscle spasms that limit hip, knee, and ankle flexibility. Massage therapy and manual therapy is very commonly incorporated into treatment plans for both short term and long goals. Many people are unpleasantly surprised to find out how tender the hip adductors and abductors have become with running. Tightness in these muscle groups compounds the effects of weak gluteus medius, and its inability to stabilize the hip during running. Graston Technique, Active Release Technique (ART) and muscle therapy treatments help break up fascial adhesions that develop between muscles. Scar tissue develops with any overuse injury. Scar tissue fibers begin accumulating around over used muscles and tendons and limit their normal movements. Over time, the accumulation of scar tissue begins altering normal muscle movements and contributes to developing IT band pain. Graston Technique utilizes stainless steel instruments to slide along the skin, producing enough shear force to break up the scar tissue. Because of the design of the tools, it is very beneficial for any tendon or ligament injury around the knee. Graston Technique is a treatment that should be considered when multiple tendon conditions have been diagnosed over several years. The accumulated micro trauma with repetitive movements and the body's compensatory mechanisms lead to developing scar tissue in muscles and tendons. Short term goals are to decrease pain and inflammation. Healing is a process and it takes time for the soft tissues to remodel and rebuild. Therapies can help accelerate the healing process. Strengthening exercises are very important for long term goals. Exercises can be given based on specific weakness in the hip and knee. Some exercises are for one muscle group, such as the gluteus medius muscle. Other exercises are for regions, such as the back and hip extensors with bridging exercise series. Movement pattern exercises help retrain multiple muscles groups to work together for a more efficient running gait. Why so Many Stability & Strengthening Exercises? Distance runners are especially at risk for weakness in the lateral planes of movement, since they usually only train the muscles that propel them forward. 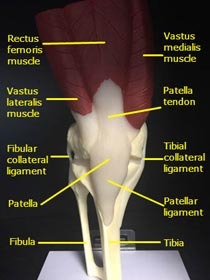 Many runners do not maximize their use of gluteus maximus, which is the largest and strongest hip extensor. Failing to properly use the gluteus maximus makes runners less efficient and slower. Running up a steep incline tests runners who can efficiently produce muscle contraction for hip, knee, and ankle extension. Followed by proper hip and knee flexion that places the leg in proper position to extend for the next foot strike. A strong runner who properly stabilizes their joints uses their gluteus maximus, hamstring, and calf to climb up the hill at a strong pace; meanwhile, a runner who is not maximizing the strongest hip extensor slows on the steep uphills and feels more of a burn in their quadriceps. Trail running uses more of the lateral stabilizers and hip extensors, and runners with weakness admit to being more sore in their hips and knees with trail running. Likewise many runners compensate with their hip adductors to pull the leg forward, and trail running will make these muscles very sore on the inside of the thigh. Running on a trail also challenges the small foot stabilizer muscles in the foot and ankle. The feet are trying very hard to maintain the arch and propulsion forward as the terrain fluctuates. With foot and ankle muscle fatigue, the trail becomes more difficult to navigate. Every wonder why some people seem to slow down on a trail and others are able to continue their pace? The answer is in strength and stability in the entire running gait muscular system. Stability exercises train muscle groups to work together more efficiently by emphasizing joint position receptors input to the spinal cord and the body’s control of the muscle stabilizers in the hip, knee, ankle, and foot. The more unstable the surface, the harder the body has to work to maintain balance. The exercises usually start on the ground and move to more unstable surfaces with improvement. 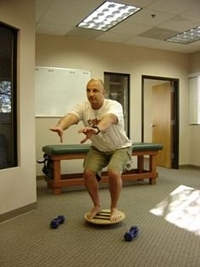 Foam, wobble boards, and BOSU balls are commonly used in therapy clinics and fitness centers. Vibration plates and machines make any exercise more difficult, as the body is continually knocked off balance which speeds the neurologic development. The body is a complicated machine, and it is amazing how well it can compensate for months and years before developing an injury. For many runners, strengthening the hip will reduce hip, thigh, knee, and leg pain. A quick test at home is standing on one foot with your eyes closed. A runner or athlete should be able to maintain balance for two minutes without touching the ground with the foot that is held in the air. People with a history of ankle sprains find their balance is often worse on the injured ankle. The lack of balance (also called proprioception) often contributes to running injuries. Weakness in the feet is compounded by muscle weakness in the knee and hip lateral stabilizers, which increases the knee wobble while running. A lack of proprioception and foot strength is found in many knee and foot injuries, including plantar fasciitis, achilles tendinitis, shin splints, patella tendinitis, and chondromalacia patella. Runners who found many of their usual soft tissue injuries started disappearing with trail running realize that they had inadvertently increased the strength and endurance of the hip, knee, ankle, and foot stabilizers. The unstable surfaces of a rocky trail make the stabilizers work harder every mile, in addition to the climbing, which focuses on the hip extensor muscles. Enhancing propioception and stabilization reduces excessive forces applied to muscles, tendons, and joints. Runners also become more efficient on the road and trail They waste less energy with inefficient movements. They also recruit the correct muscles for hip extension, hip flexion, knee flexion, and plantar flexion. The improved neuromuscular control makes runners faster in every distance from a 5K to a marathon. Prevention of IT band injury requires a combination of reducing stress to the IT band, proper footwear, and smart training. Running on level surfaces or alternating directions on the road will help reduce the stress to the IT band. Training that rotates running on the road, canals, or trails will reduce the likelihood over overuse injuries. Self treatment of ice, stretching, specific stabilization exercises, massage, and foam rolling can help prevent IT band injuries and maintain the gains achieved in therapy. A balanced training program that promotes proper amounts of running, strengthening, stretching and rest will likewise reduce many IT band injuries. If you suspect that you are suffering from Iliotibial Band Syndrome, quickly take steps to reduce the stress on the tendon. Waiting for the pain to increase will produce a more severe injury that will require more treatment. If an injury fails to resolve quickly, seek care from an experienced provider who can keep you running while taking all of the steps necessary to resolve your IT band injury.